Sometimes you just can’t go on vacation. Whether it be a schedule issue, a money issue, or an issue agreeing on where to go next, it’s always a bummer when you don’t have a vacation to look forward to. So what’s the next best thing? Bringing the vacation home! I’ve teamed up with the amazing online interior (and exterior) design company Laurel & Wolf to dream up my ideal living space. Since I live in Florida, I naturally decided to conjure up my dream outdoor living space. And the timing is perfect, since the Husband and I are in the process of upgrading our patio (within budget constraints, unfortunately). Laurel & Wolf is born from the idea that great design transforms the way individuals work, live, and love. Their online interior design service connects anyone looking to design their space with a marketplace of professional interior designers, and after four easy steps, clients receive a personalized, beautiful design package. You can learn more about the process here. Here is what my yard looks like. You can see why I was so excited for this idea. There’s a lot of unused space that could be transformed in to an amazing retreat. Ok, what would I need in a yard to make me feel like I was on vacation without leaving my house? My style tends to lean towards a Mediterranean feel, which makes sense since Italy is my favorite place in the world and Greece is the number one place on my travel bucket list. It’s classic, it’s romantic, and the colors are relaxing yet eye-catching. You can tell from the color that I recently had my house painted that I really enjoy a lot of color. Boring things first: I need a new fence. We recently got some quotes and I can’t believe how pricey they are! But privacy is important so it has to be done. We decided on a white vinyl fence for practical reasons. It’s less maintenance. All you have to do is wash it. Plus the white is a nice blank canvas for all the color I want in my yard. Next, we need some shade. On the far end of the patio I would put a sun sail and a ton of flowers, just like this. Instead of that hanging chair, I would like one that would be more comfortable to sit and read in. I’d take either one of these (or both!) from the Laurel & Wolf blog. On the side closest to my house I would put an area where all of my friends and family could get together. From the Laurel & Wolf Pinterest page. 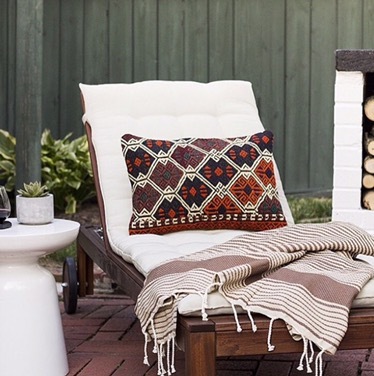 Isn’t that the most gorgeous outdoor living room that you’ve ever seen? I can see myself having coffee there in the morning, drinks in the evening, and book reading all day long! Looks so relaxing, enjoyable, and fabulous, doesn’t it? I bet the Husband would love sitting there, eating pizza that he made in the outdoor pizza oven. There’s only one thing missing, the pool! I don’t want a large pool, I just need it for cooling off, relaxing, and hanging out with friends. From Houzz, by a local Tampa company Landscape-Fusion, who is actually coming to my house next week for a quote! Isn’t that the best little pool that you’ve ever seen??? The pool is missing just one thing: lounge chairs! I love this chair and the white cushion! I would use brightly colored pillows and exchange the blanket (it’s summer in Tampa) for soft, absorbent towels. Image from Laurel & Wolf’s Instagram. From Crate and Barrel’s Pinterest. Wouldn’t those pillows look great on the lounger above, next to that beautiful pool? There you have it, my dream outdoor living space! Luckily the Husband has the same taste so if we ever stop spending our extra money on traveling we could have our dream yard. We are doing a much less extravagant upgrade over the next few months, so I’ll be sure to update this post with photos of how my dream outdoor living space translated in to my budgeted living space! What area would you upgrade if you could do anything you wanted? Are you more of a gourmet kitchen kind of person? Maybe your living room isn’t great or you dream of a master bedroom retreat? Head over to Laurel & Wolf’s website for inspiration! You could have a bunch of those lovely hanging chairs on your porch!